The battle continued above. Soldiers fired, dragon riders attacked. The bolts of blue and green energy looked like a colorful lightning storm against the twilight sky. A dragon swooped in on the upper stadium tier, took a fallen soldier in a red beret and drew him up into the night sky. It was almost too dark to see what was happening. Then the stadium lights came on. The sudden illumination hit the snake warrior army down in the playfield, now two-hundred strong at least. Their collective hiss at the light sounded like a gale through a forest of autumn leaves. The unfortunate soldiers on the lower tier of the stadium shouted with new alarm. Someone fired into the ranks of snake warriors. The creatures reacted immediately. 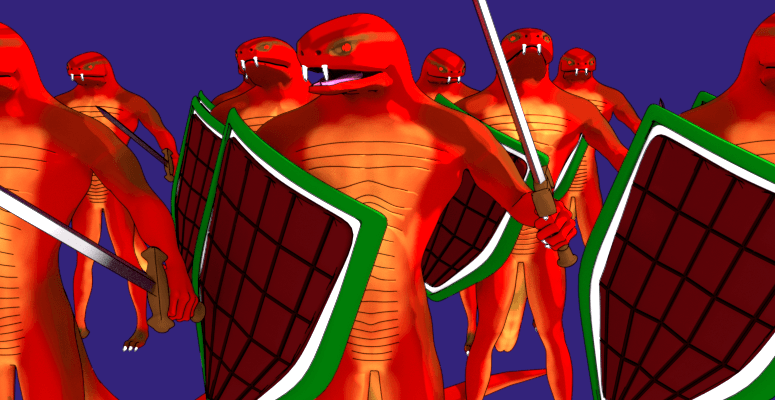 A squad of snake warriors raced across the playfield, shields held up before them. They leapt up over the high barricade into a trio of soldiers. With quick slices, they cut the men down. Eddie watched all of this, petrified. "My fault my fault my fault my fault," he muttered. The snakes were killing soldiers. Bryce was gone. Kardhoom had escaped. Galatina was with them. All of it was Eddie's fault. "Don't just stand there," Syd shouted. He knelt by Phyllis, trying to get her upright. Phyllis groaned. "But, Kai," Eddie muttered, scanning the playfield and stands. Most of the refugees had gotten out, but a few stragglers were running from snake warriors. Several lay dead. The snake warriors quickly cut down any who stood against them. And then he saw the head of the boy—Timmy—dart out of a bunker at the far end of the playfield. Eddie saw him for only an instant. Then a swarm of snake warriors obscured him from view as they radiated out into the stands in all directions. "What's going on?" Phyllis asked, rubbing her head. "We're under attack," Syd shouted. "We've got to get out of here." But snake men were already on them. One stopped behind Syd and raised its sword. My fault. Eddie raced forward, moving to tackle the warrior. The creature batted him aside with its shield. It prepared to attack again. 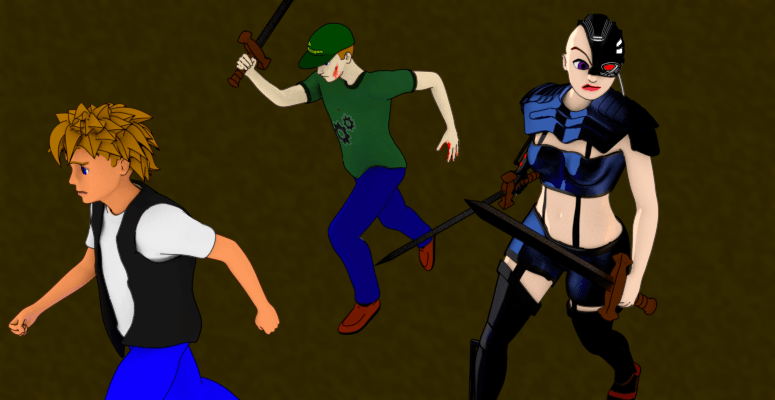 Phyllis leapt up and grabbed the creature's sword arm. They struggled for a moment, the snake's hissing face glaring into Phyllis's determined eye. Then she head-butted the creature and sent it toppling back. 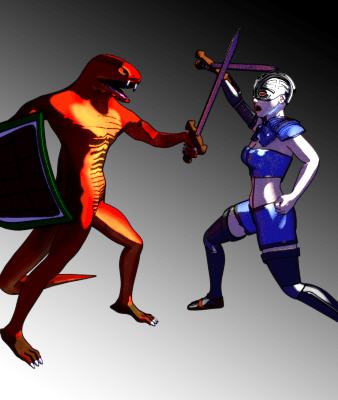 She wrenched its sword away and sliced it behind her as another snake warrior moved in to attack. She cut the monster almost in half. Eddie couldn't answer. He turned back to the playfield. There were still dozens of snake warriors down there. Had they found Kai yet? Eddie moved without thinking. He hopped over the bottom benches and over the barricade into the playfield. He had to save her. "Eddie," Phyllis shouted. "What the hell?" He skirted the side of the playfield. There was no hiding in the stadium lights. Soon, a dozen snake warriors closed in, blocking his way. He spun around. Where could he go? Phyllis and Syd were fighting in the stands. Syd had a sword of his own. Phyllis had two. They fought well, but there were too many foes for them to last long. The snakes closed on Eddie. He was trapped now against the barricade. Snakes coming at him from both directions. This was it. The snake closest to him raised its sword for a final blow. Eddie huddled there, put up a hand and winced away. He looked up. The snakes retreated, finding new targets for their attack. There were too many snakes in his way to make a direct run towards Kai. He backtracked towards Phyllis and Syd. A snake turned to face him, raised its sword. When it made eye contact with Eddie, it lowered the sword and ran away from him. They were avoiding him. Why? Was it because he'd carried the stone? It didn't matter. He had an advantage. He glanced downfield towards Kai's hiding place, then back towards Phyllis and Syd. The two were still fighting, fallen snake warriors all around them. Syd had a cut down his cheek, blood running over his jaw. They retreated from a new wave of warriors, onto the steps leading down onto the playfield. Eddie found himself alone. There wasn't a snake within ten yards, as if he had a bubble of protection. "Syd, Phyllis," Eddie called. "This way." Syd glanced back, found no snakes behind him, and turned to run. "Phyl!" They both raced to Eddie, swords held ready. Snake warriors followed, and Eddie ran to intercede, nearly getting hit by Phyllis's swinging sword. The moment the snakes saw Eddie, they broke off their attack. "Why are they stopping?" Phyllis shouted. "They won't attack me," Eddie said. "I don't know why." She watched them, swords still held ready. "What now?" "I think Kai's in that bunker," Eddie said, pointing. "The dragon rider got him," Syd said, holding a bloody palm to his cheek. "Speaking of which, it looks like the dragons are all gone." "That's no comfort. Let's go get Kai." They raced across the field. Snakes closed in on them and Phyllis engaged them. Eddie waved his hands. "Stop," he shouted, running forward. "Leave us alone." 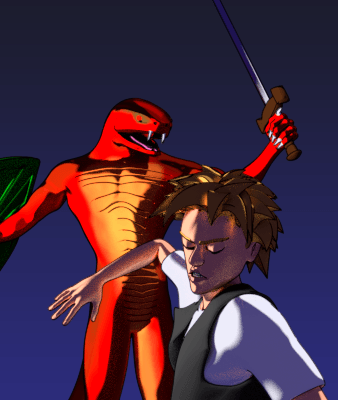 A snake that clashed swords with Phyllis turned to face Eddie, earning it a decapitation by Phyllis's sword. "I'll run ahead," Eddie said. This turned out to be a bad idea. A snake warrior, sensing movement behind it, turned and swung at Eddie. The tip of the sword only missed Eddie by a hair. The instant it saw him, it broke off. "Uh," Eddie said, rubbing the side of his neck where the sword had nearly sliced him. "I'll... walk." But the snakes had noticed the bunker now. A squad of six warriors approached it, swords raised, side-stepping around to its open side. 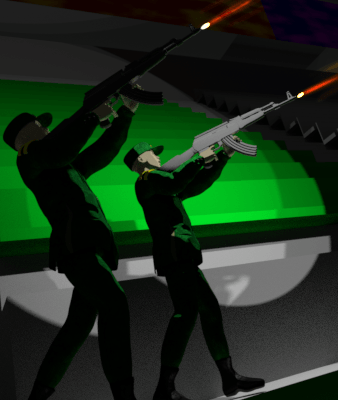 Phyllis leapt over Eddie, swords outstretched, and soared towards the top of the bunker. She cut two down before she had landed. The others spun on her. One had time to swing at her mechanical leg. The sword bit a quarter inch into the metal, then stopped. Phyllis decapitated it before it could pull its blade free. She spun around just in time to stop another blade from finding her neck. In two seconds, all six snake warriors were dead. Eddie ran to the bunker entrance. It was dark inside. "Kai?" He reached in, and a pink hand swung out to catch it. He whipped his hand back before they made contact. It was Timmy Barlow. Eddie stared at the boy. "Come out, you two," he said. Kai climbed out of the shadows, terror in her eyes. "Are the snake people still out there?" "Yes," he replied. "But we're getting out of here now." He frowned at the boy who held Kai's hand. "All of us."